Launched in 2015, the Kids to Camp Club is exclusive to CENTURY 21 Network members who raise $2,100 or more in a calendar year in support of the C21 Kids to Camp Program. Any and all donations you make, or fundraising that you do, counts towards helping you achieve Club Member status and earn a CENTURY 21 Golden Heart Award. Whether you make a one-time $2,100 donation on your personal fundraising page, participate in an Easter Seals event and collect pledges, hold your own fundraising event, or commit to a series of $21 Closing Gifts for Kids donations—it all counts! But remember, if you do your fundraising, or make your donations anywhere other than on the Kids to Camp website, you MUST report it to your provincial Easter Seals representative before the end of the year. It costs an average of $2,100 to send a child living with a disability to an Easter Seals fully-accessible camp. By becoming a Kids to Camp Club Member, you will provide at least one child in your province with a summer camp experience they will never forget! 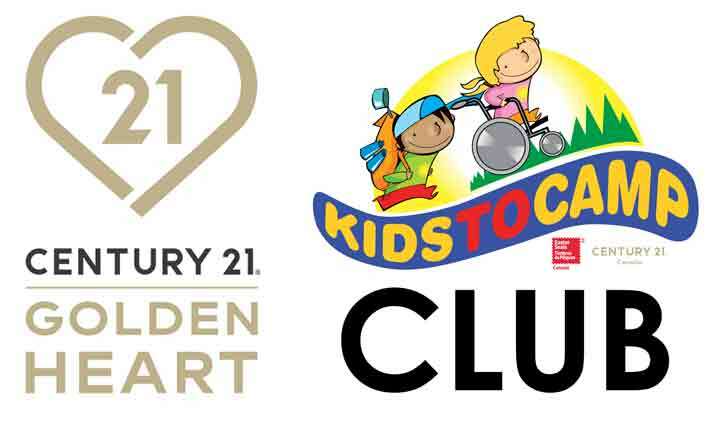 A digital badge indicating Club Membership to use within all web environments or print marketing materials, signifying you as a "Kids to Camp Club Member"
Congratulations to our past Kids to Camp Club Members and CENTURY 21 Golden Heart Award recipients. View the full 2017 list here (PDF). View the full 2016 list here (PDF). View the full 2015 list here (PDF).